Knee warmers in a jar. 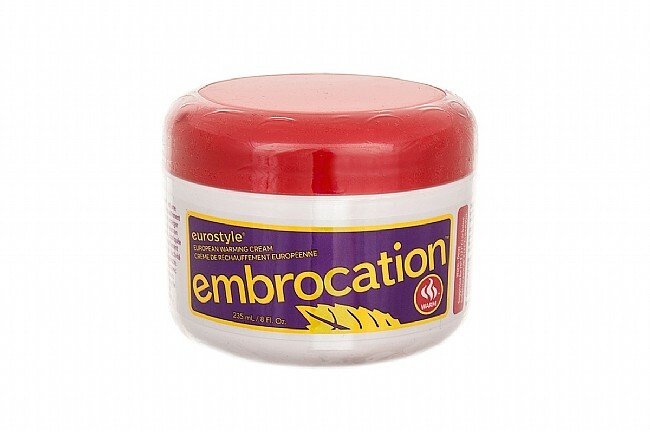 Apply Paceline Eurostyle Warm Embrocation directly to the skin to warm up your cool weather rides. The warming formula is non-greasy, easy to apply, and leaves no mess. Ideal for early season road racing when Hot embrocation is not needed. 8oz jar. Can't live without it !!! Great for the knees on a cold day - running or cycling. Use it on my back when playing tennis or weight training. Got to have it ! Great way to extend the season! Cool weather doesn't bother me much - but my knees take a long time to warm up on those cool mornings! Warm embrocation is a lifesaver, giving me an hour of subtle warmth to get my knees up to speed. The temp is mild and hardly noticed, in fact, I don't really even feel like my knees are warm - they're just NOT cold! No more knee warmers, no more long bibs - just my embro! I rated it 5 stars... like molten lava hot 5 star Thai food. I bought this for 'cross season because I don't like being cold, but I also don't like racing in tights or knee warmers. I've heard that this stuff is the ticket. Before actually using it in a race I figured I'd give it a try on an indoor trainer ride. I applied what I thought was a reasonable amount to my legs, rubbed it in well, washed my hands and jumped on the trainer. For the first 10 or 15 min. I thought I got a dud container as I didn't feel much. Then the heat started to come on. And then it got hotter, and hotter, and hotter. By the end of my 1 hr. trainer ride I was pretty certain my legs were actually on fire. I sprinted to the shower and washed my legs well with lots of soap. Although there was no immediate relief, after about 30 min. the heat came down to a moderate simmer. Within an hour or so after my shower the heat was pretty much gone. So I learned a few lessons 1. PaceLine Eurostyle Warm Embrocation is NOT for indoor use, 2. A little bit goes a long way, 3. There is no off button to the heat - you can wash it off but it still takes a while for it to run its course. But do I think it's going to be perfect outside in the cold and wet? Definitely! My only word of caution is that I would make very certain to wash hands after application, and avoid getting this stuff anywhere near sensitive body areas. Seriously. First time( and LAST!) user of this Embrocation crme. I applied a small amount to my lower legs before my morning ride. Temp was low 40's at the start. I didn't feel no heat at all, like I didn't put enough on. Two hours into my ride, the temp raises and the hills get steeper...I start to sweat. Oh boy, its working now....right when I don't need it. This isn't a warming sensation but rather like a chemical burning sensation. Legs are on fire...20 miles out on gravel. I managed to get some off with a moist towelette I had in my saddle bag and made it home. Legs still burned for a hour after showering. Maybe I did something wrong but I'm done with this. Mild, not wild, but stays with you for the ride and then some! Paceline is a good embrocation that goes on smooth and is not greasy. In terms of heat, I would say it provides moderate heat to get your applied parts warmed up, but won't set you on fire-and to my taste, that's a good thing. I prefer a slow burn. What surprised me was how long it lasts. Even after a two-hour ride, post ride stretch, and a good hot shower, I could still feel the embro working. Fabulous. No need for Icy Hot!